1677 - 1682 FINCH, Heneage, First Earl of Nottingham (1621 - 1682) - Born 23 December 1621, probably at Eastwell, Kent. Eldest son of Sir Heneage Finch, Knight, Recorder of London and Speaker in Charles I first Parliament, and of Frances, daughter of Sir Edmund Bell of Beaupre Hall in Norfolk. Charles I created his grandmother, Elizabeth, Countess of Winchilsea. His uncle was Sir John, Lord Finch, and Keeper of the Seals to Charles I. He was educated at Westminster School. In 1635 he became a gentleman commoner at Christ Church, Oxford. On the sudden death of his father, also Heneage Finch, he left; before taking his degree. He did, however, enter the Inner Temple where he soon became a proficient student, and read for the Bar. He was called to the Bar in 1645. He, apparently, took no part in the troubles of the Civil War concentrating instead on building up a lucrative private practise. At the Restoration, in 1660, he was returned as Member of Parliament for the City of Canterbury. On 6 June 1660 the King again showed his favours by making him Solicitor General and, the following day, he was created Baronet of Ravenstone, Buckinghamshire. In April 1661 he was elected to Charles II second Parliament for the University of Oxford. On the death of Sir Jeffrey Palmer, Sir Heneage Finch was made Attorney General on 10 May 1670. Soon afterwards he became Councillor to Queen Catherine. From 1673 - 1676 he was Chamberlain of Chester. On 9 November 1673 his ambitious hopes were realised when he received the Great Seal. He was created Baron Finch of Daventry, from the Manor he owned in Northamptonshire, on 10 January 1674. He reached the summit of his profession and became Lord Chancellor on 19 December 1674. The purchase of the Manor of Milton, from Henry Stafford and Anne Dawes, widow, was made in 1677. This was a joint purchase with his eldest son, Daniel. For 9 years he held the Great Seal and presided over the Court of Chancery. On 12 May 1681, as a further reward for his services to the crown, he was created Earl of Nottingham. In 1646 he married Elizabeth Harvey, daughter of Daniel Harvey a London merchant. Their eldest son, Daniel was born in 1647, and became second Earl. Heneage, the second son was Solicitor General and created Earl of Aylesford. The fifth son Edward (1664 - 1738) was a composer. He died 18 December 1682, in London, and was buried at Ravenstone, Buckinghamshire. 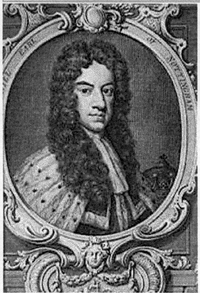 1682 - 1730 FINCH, Daniel, Second Earl of Nottingham and Seventh Earl of Winchilsea (1647 - 1730) - Like his father he was educated at Westminster School before proceeding, in 1662, to Christ Church, Oxford, as a gentleman commoner. On leaving Christ Church, without a degree, he was sent to travel in Europe, mostly in Italy. Subsequently he entered the Inner Temple and was chosen F.R.S. 26 November 1668. He was elected to Parliament for Great Bedwin, Wiltshire 10 February 1672 although he did not take his seat. He became a Privy Councillor 4 February 1679 and was made Lord of the Admiralty 22 April 1679. The Borough of Lichfield returned him to Parliament on 7 August 1679. First Lord of the Admiralty from 19 February 1680 - 22 May 1684. He was elected Member of Parliament by both Lichfield and Newtown, in March 1681, but was called instead to the House of Lords by his father's death 18 December 1682. 1730 - 1769 FINCH, Daniel, Lord Finch, Third Earl of Nottingham and Eighth Earl of Winchilsea - Married Frances, daughter of the Earl of Denbigh. 1769 - 1826 FINCH, George, Fourth Earl of Nottingham and Ninth Earl of Winchilsea (1752 - 1826) - The portrait to the left is of George Finch at the age of 19. Painted in 1771 by Nathaniel Dance. George succeeded to the title in 1769, at the age of 17. 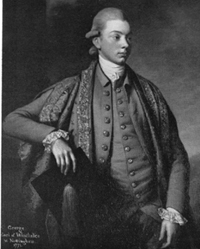 He was an undergraguate at Christ Church, Oxford and is seen here wearing the robes of the day. In 1804 he became Groom of the Stole to George III, and in 1822 accompanied George IV on his tour of Scotland. When he died in 1826, unmarried, he was succeeded in his titles by his cousin George William Finch-Hatton. His house at Burley on the Hill, and at least the titles of Lord of Milton Keynes, Burley and Ravenstone manors, were inherited by his illegitimate son, George Finch, who was born in 1794. 1826 - 1870 FINCH, George, of Burley on the Hill (1794 - 1870) - Illegitimate son of George Finch, 4th Earl of Nottingham and Ninth Earl of Winchilsea. He was granted the use of the Finch arms in 1809. Marrieed twice, his first wife Jane, daughter of Vice-Admiral John Richard Delap Tollemache, died in 1821 only 2 years after they were married. His second wife was Lady Louisa Somerset, daughter of the 6th Duke of Beaufort. Member of Parliament. 1870 - 1907 FINCH,George Henry (1835 - 1907) - Son of George Finch and his second wife Louisa. Born 20 February 1835. Educated at New College, Oxford. He married Emily Eglantine, daughter of John Balfour of Balbernie, Fife in 1861. They had a son, Alan George Finch, born in 1863 and 2 daughters Magdalen and Gwendoline. Emily died in 1865. Shortly afterwards he became Conservative member of Parliament for Rutland, in 1867, which he remained for 34 years. He married again in 1871, Edith, daughter of A. Montgomery, Commissioner of Inland Revenue. Their children included Wilfred Henry Montgomery Finch. Altogether his marriages produced a total of 10 children, 3 sons and 7 daughters. Also a Justice of the Peace and a Member of the Carlton Club. Died 22 May 1907. "The Induna was bewitched. We shot him with six rides and he still fought. A wounded man passed a new gun to him all the time. but we killed him at alst and the wounded men who could not fight just put their hands over their eyes while we ran assegais into them. Ah I they do not like the Mashonas. They never cry or groan. They are Men"
1914 - 1939 FINCH, Wilfred Henry Montgomery (1883 - 1939) - Son of George Henry Finch and his second wife, Edith. Educated at Charterhouse. He appears to have been in the Armed Forces, reaching the rank of Lieutenant, retired. Shortly prior to his death he was a temporary Lieutenant in the Royal Engineers. Lord of the Manors of Burley, Oakham, Ravenstone and Milton Keynes. Club - Bath. He never married, and upon his death his titles and property passed to Colonel James Robert Hanbury. 1939 - HANBURY, Colonel James Robert - Great nephew of George Henry Finch. His grandfather, Colonel Evan Hanbury married Gwendoline.